Welcome to the second installment of my gift guide posts. Today is all about what to buy for all the women that are in your life! . The first thing that I would like to suggest is shoes because most women love a good pair of shoes. The two that I have decided to talk are quite casual shoes from Schuh mainly because they're two pairs that I adore the look of from their website. I am only mentioning two pairs but they both offer something a little bit different. The first pair that I am going to suggest as a present are the Vans x Disney Pixar Toy Story Woody and Bo trainers that come in a lovely pink colour to represent Bo Peep with little versions of Woody and Bo Peep together. 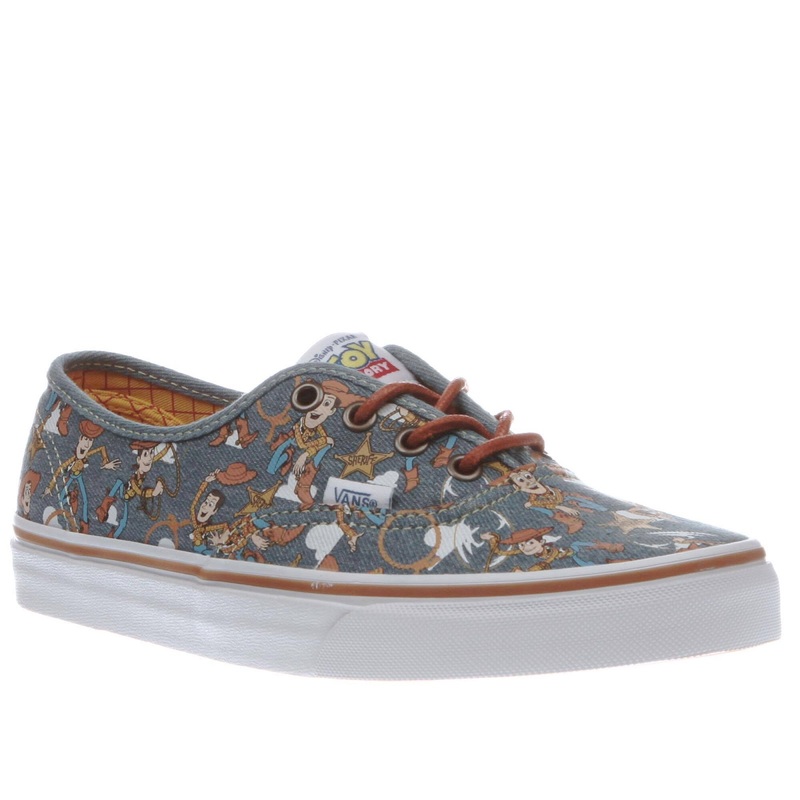 These trainers would make a lovely gift for any female in your life who loves a good pair of Vans or Toy Story. I will link them here in case you want to pursue the trainers more or in case you can't resist them and end up purchasing them as a gift for someone or yourself. The second pair of shoes that I would suggest for Christmas gifting are Dr Martens Pascal Sparkle boots which I love the look of. 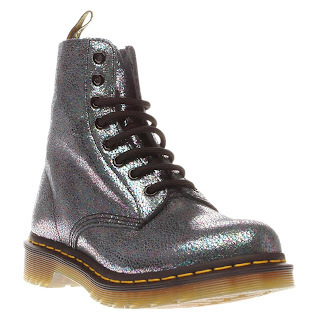 I love Dr Martens as they give an authentic look to any outfit that they are paired with. I adore how this particular pair of boots have a pearlescent finish to them which makes them perfect for all year round! The link is here in case you want to buy them. I also think that most things that are stocked at Simply Be make excellent presents so I thought that I would suggest a couple of them to you in case the woman within your life loves a bit of fashion. 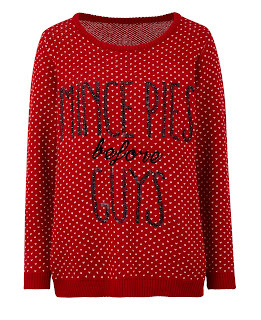 The first item that I think would make a perfect Christmas present is this statement jumper which says 'Mince Pies Before Guys' on the front of it. I love it straight away just because of the statement! 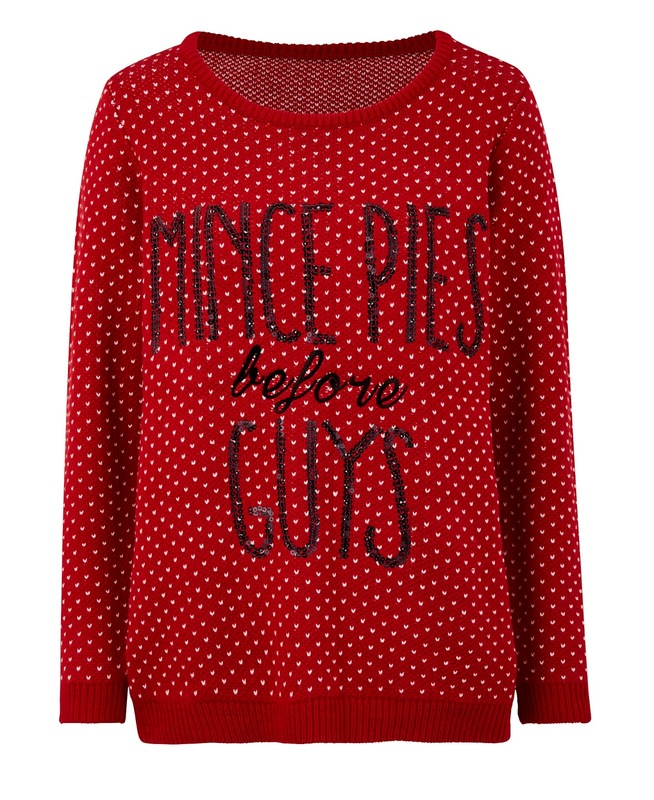 As this design isn't too festive, it means that you can get away with wearing it after the Christmas period. I know that may sound a bit odd to do but Christmas jumpers are normally quite thick and its always a bit cold within England so thick things need to be worn now and again. Click here to have a proper gander at it. Who doesn't need chunky knitted jumpers? Am I right or am I right? 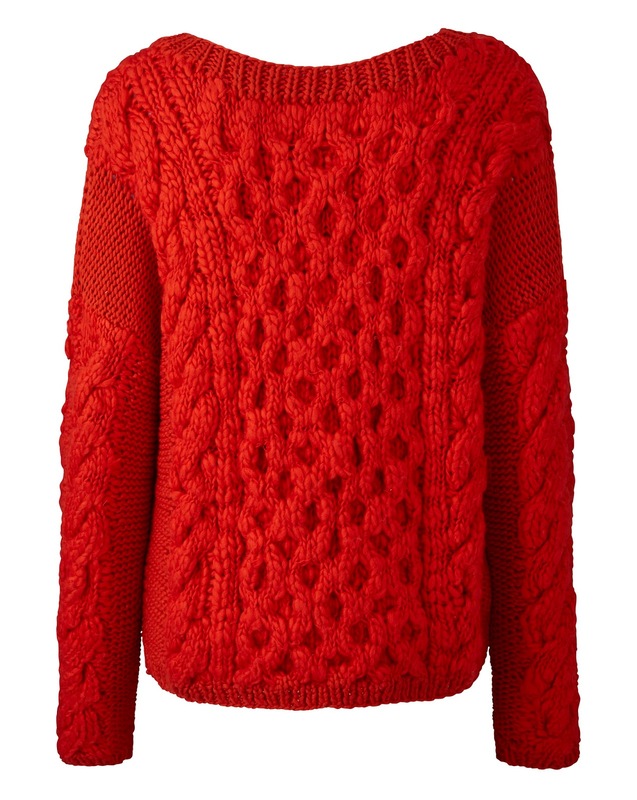 I love this chunky cable knit jumper as it instantly looks like its going to make you feel warm and comforted when you put it on. I love the deep red colour of the garment. It would definitely go well with a red lip! Come and click here to find out more about this product. 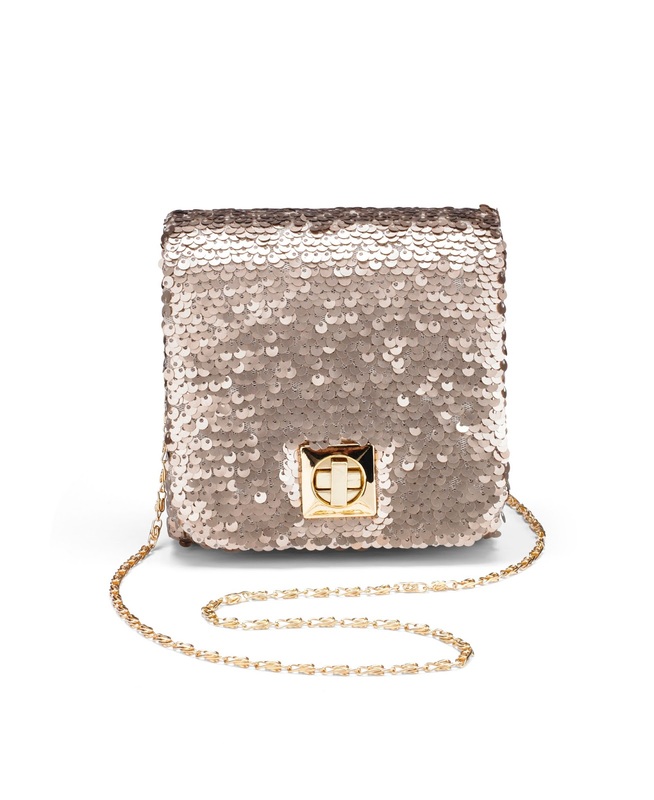 The last item from Simply Be is a Mini Sequin Shoulder Bag. It just screams fun, festive and fabulous! 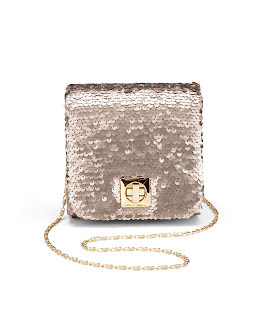 I adore the twist lock clasp thats on the front of it as it instantly makes me wonder what is inside the bag and I just love the sequin detailing on the front of the bag. My eyes are drawn to instantly. It would make a great bag to take to any event, party or night out. Click here to find out more. The last place that I am going to suggest gifts from is Debenhams. I know that Debenhams might be a slightly expensive place to shop from but they sell amazing gifts so I thought that I would suggest a few gifts to purchase from there if you wanted a few good stocking fillers. Everyone loves cocktails! This gift set contains a shaker, 4 stirrers, 5 straws, 1 of 70ml Cranberry Syrup, 1 of 70ml of Peach syrup and 1 of 70ml of Lime syrup. I think the contents of this set make an excellent starter set for anyone who loves a good cocktail! Click here to find out more! Final stop on the gift guide! It might pick you up a bit! Do you know anyone who loves their coffee more than anything in the world? If you do then get them this gift set which contains a Costa ceramic takeaway cup, silicone lid and a packet of stem ginger biscuits. I love the concept of having a ceramic takeaway cup as I find some regular cups to be a bit too small sometimes. I think the silicone lid is kind of cute. Click here to find out a bit more about this set. Do you like any of the gifts mentioned above? Let me know down below! So there you go, thats my gift guide for her done for 2016. I know that it's a little bit short but I thought that it would be best to focus on a few instead of having a post that's out of control via links etc. I hope that you have enjoyed this blog post. Don't forget to come back next week for the final installment in my gift guide for 2016 set. This post contains images sent from PR teams. All views and opinions are my own.